Our USA Push Pin Map Slate Edition is THE most detailed USA National Parks List Map available anywhere! This unique travel map features all of the National Park Service (NPS) Parks, Historical Parks, National Monuments, Battlefields, Lake shores, Preserves, and other fascinating destination spots preserved for our nation. Created by a professional geographer/cartographer, the research and design for this USA travel map took over a year. We worked with official National Park Service data to uniquely display and reference ALL of the 600+ sites in the USA. Every reference has been thoroughly researched, symbolized, and carefully labeled on the map. A unique referencing system has been developed for areas that have many NPS sites and a unique colored coded label system has been created on the side. Our USA travel maps are truly one of a kind. Each map includes fascinating details that encourage exploration and self-discovery. Love my map! Made perfectly, timely, and just as described. Good, quick communication with the personalization. Thank you! We can't wait to fill up our map with push pins! This is such a nice map - my family will enjoy tracking our National Park adventures! 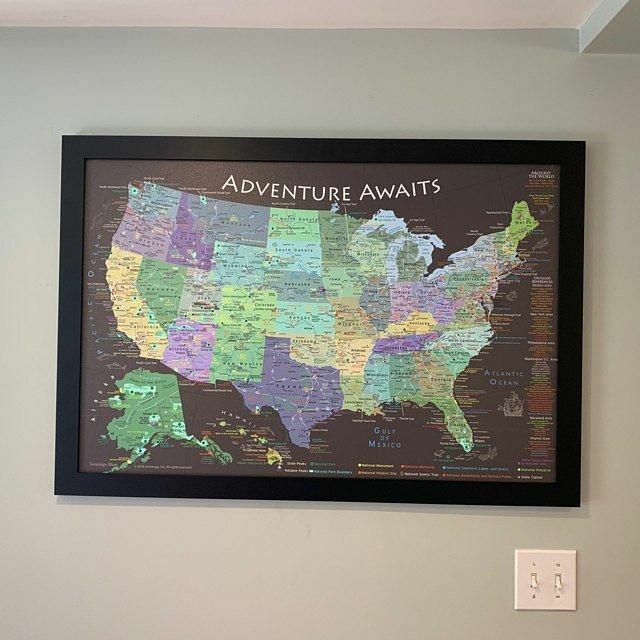 We gave this map to our daughter and son in law. They are on their way to visit all of the National Parks with their family. They love the Map!